This short video tutorial from our video series teaches users how to change their own password in Your Profile. Navigate to the Your profile edit page. Enter a new password and check it for strength. The password and email address attached to your username can be changed at any time using the Your Profile screen. And here’s some info about changing your password you can use to complement your videos — if you like! 1. Go to Users > Your Profile or Profile > Your Profile in your site dashboard. The menu item you use depends on what role you have been assinged on a site. 2. Scroll to the bottom of the page to the New Password area. 3. Type your new password into both boxes and click Update Profile when you are done. TIP: Using a combination of letters, numbers and symbols makes it hard for others to guess your password. The strength indicator provides an indication of how good your password choice is! This short video tutorial from our video series introduces users to creating and editing users inside WordPress. All other fields in this view are optional. Subscriber – This is the default setting for a basic user which can login and read content only. They have no posting capabilities, other than the ability to leave comments on posts on the front end of the site. Contributor – This is the next level up from Subscriber, and contributors have the ability to add content, but not publish it. Content added by contributors are put into the administrator’s “pending” posts panel for approval before publishing. Authors – Can do everything a contributor can do, and can also publish their own posts. They cannot, however, edit content created by other authors to the site. They can only edit their own submitted content. Authors can also add media to the site and their own posts. Editor – Can do everything authors can do, and have the ability to edit content created by other authors on the site. Administrators – Have complete control of the site and all its areas, including themes, plugins, and user creation and editing. 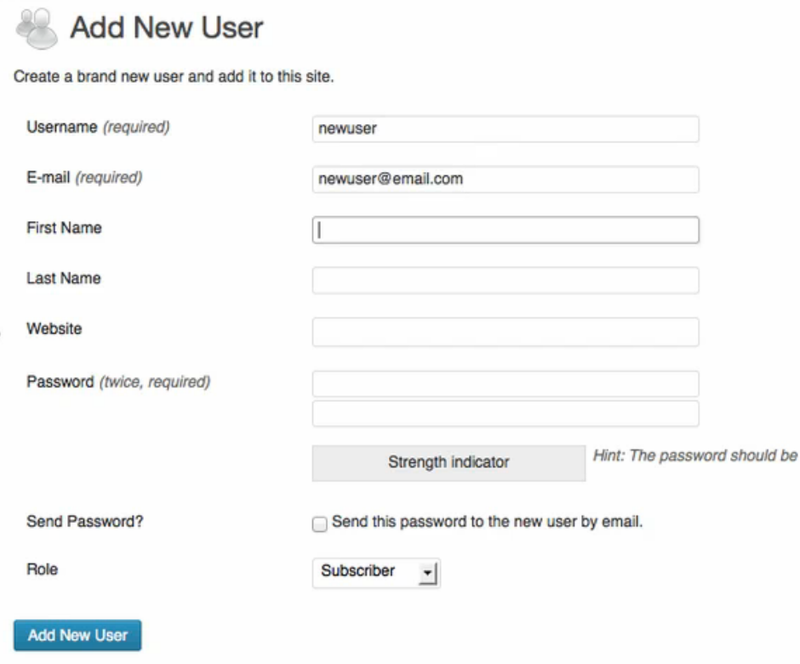 To edit a user, hover over the user’s name in the All Users panel in the WordPress Admin. Links to edit or delete that user will appear – click edit. This brings up the edit profile screen, showing more information options than when the user is created. You, or the user, can add various snippets of additional information, including a nickname, which determines how the user’s name is displayed on the front-end of the site – like in comments, post meta, and forums. WordPress also includes fields for several social media profiles and a text box for biographical information. These inputs can be especially handy for a multiple author site that wants to show off personal information for its authors. This increases engagement with your site and interest in its member users. This flash video tutorial from our video series introduces to editing posts or pages. Clicking the action link Edit opens the post into full edit mode where you can edit the post/page and/or configure post options such as passwords, categories, tags and the timestamp. Clicking the action link Quick Edit opens the post/page options letting you configure features such as title, status, passwords, categories, tags comments and the timestamp without having to edit the full post/page. This short video tutorial from our video series introduces users to creating ordered (or numbered) and unordered (or bulleted) lists in posts and pages. Lists are used to outline and organize information. Bloggers use them to make their content easier to read. Replacing an image is a very common task when working with posts and pages, yet it’s as simple as removing an existing image and adding a new one .